I've always been a fan of the ever comfy Melissa jelly flats so you can imagine my excitement when I saw these ice cream pumps! The face of the campaign is Cara Delevingne! I know.. can it seriously get any better?! The ice cream pumps are avaliable in various colors and variation of glitter color ice cream cones! Check them out! Tell me! which pair of delicious ice cream cone pumps would you like to take home? 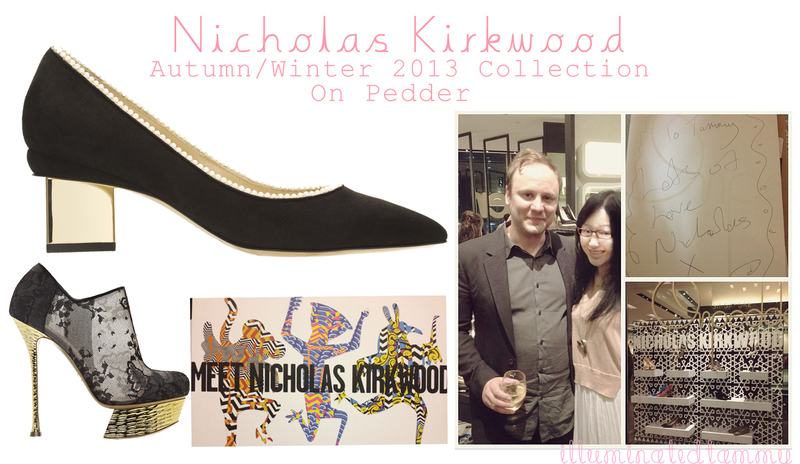 A few days ago [June 19,2013], I had the privilege of attending the exclusive Nicholas Kirkwood autumn/winter 2013 collection preview hosted by On Pedder Singapore. If you live in Singapore too, you would probably remember how intense the haze got on that night but I knew this was an event not to miss! I rushed down to On Pedder and woah did I make the right decision! I would've never forgiven myself if I had missed this event! "Nicholas Kirkwood launched his debut collection in Spring 2005 to challenge the conventions of woman's luxury footwear. Beyond his label, Nicholas has worked alongside established and emerging brands to create shoes for their runway shoes, such as Fendi, Erdem and Peter Pilotto"
The Autumn Winter 2013 collection features bold architectural lines; "taking a subtle reference from the wave inspired curves of Spring Summer 2013 collection to form defined arches." This collection was no exception to his love of witty and quirky embellishments such as "mesh, fur and sheer frill; all which help execute this playfully decadent collection perfectly!" It was amazing seeing the collection up close and personal, they were absolutely exquisite. I loved that the collection was a mixture of elements. I could see a variety of women wear this collection, a fun bold girl heading to a 70s party could be seen rocking the low triangle heel pump in black and white chevron printed suede with a touch of the beautiful gold chrome heel; alternatively, a woman looking for a more subtle but powerful pair of statement heels could go for the ever feminine elegant laced high heel pumps with a contrasted strong bold textured gold heel. If I had to pick my absolute favorite pair, it would most definitely have to be this pair! I was chatting with Nicholas about how in love with them I was and that I would have totally worn them to the Great Gatsby Tiffany premiere I attended a few weeks ago if I had seen them then! I was in LOVEEE with everything about this pair of shoes! How elegant and sophisticated are the baby pearls around the rim of the shoes? It would glam up any little black dress! The other thing I adored about this design was the gold chrome heel, I thought it was extremely chic, classy yet ever so powerful; it definitely makes a statement! Even though I love wearing high heels because I'm a shorty! I definitely still gravitate towards flats so this pair of low heel is the perfect marriage combining my two favorite things! A hybrid of a high heel and flats. love love love! Photo opp time! :) On that note.. I apologize for the delay of the Peter Pilotto post too! I've just been so busy! good busy though!<3 But how cool huh? 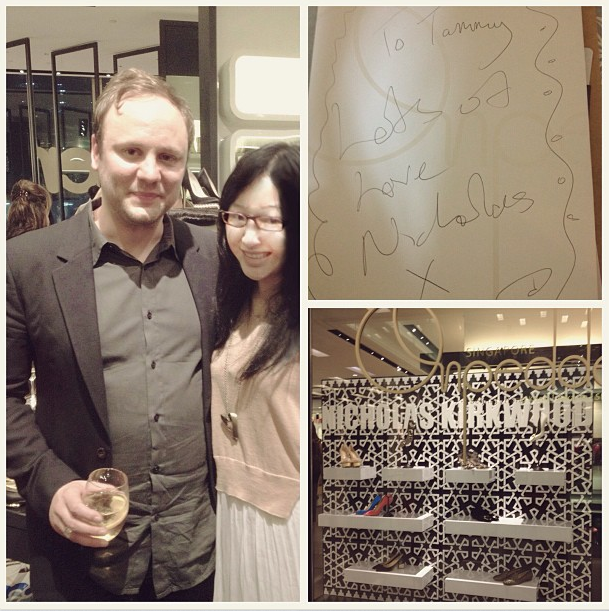 Meeting Peter Pilotto and now Nicholas Kirkwood yay! 2013 rocks! It was such an honor meeting Nicholas after having been such a fan of his designs in my college years. Who knows! maybe one day I could be collaborating with him for my runway collection shoes;) A girl can dream! Head over to On Pedder and check out these beautiful creations! I promise you won't regret it! 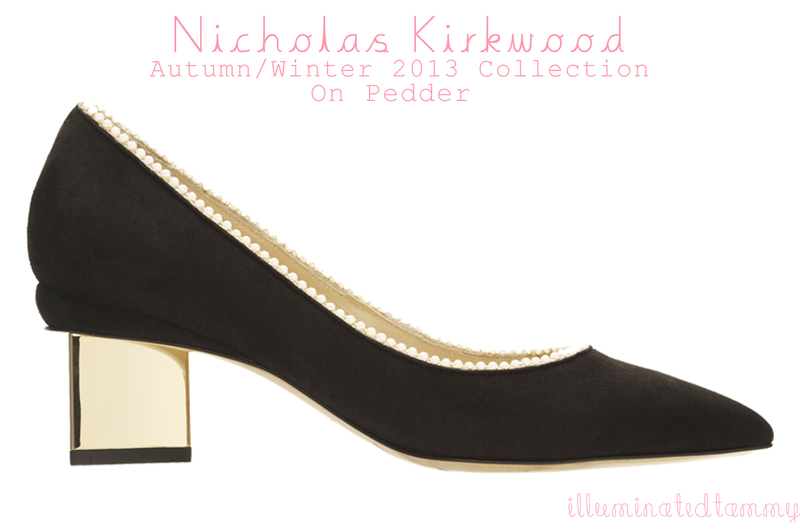 Also check out the official Nicholas Kirkwood website! **Sorry that it took me so long to write this up and I didn't get to take much pictures because I'm still recovering from my sore hands! Yay! My favorite category to write, my Marc by Marc Jacobs spotlight feature! I really wanted to share this awesome find with you guys before it goes off the shelf! So.. here we go! Today I'm introducing to you my new favorite skirt from Marc by Marc Jacobs, it is the Stacy neon checked taffeta-twill skirt! 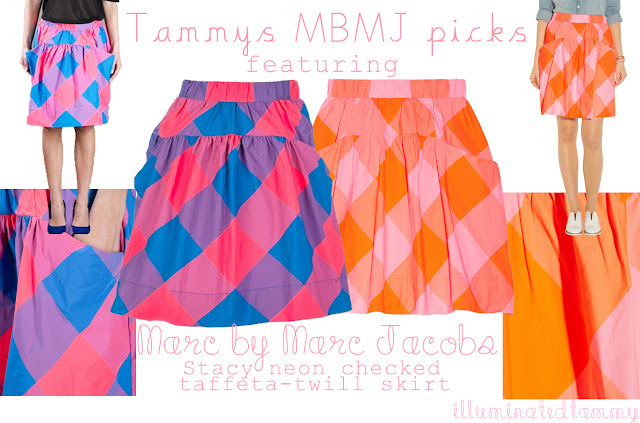 This awesome skirt is offered in two fun candy colors, a pink/blue/violet check and a orange/pink/coral check! It has a super fun bubble balloon shape with oversized pockets! If you were wondering, I own the pink/blue/violet check version! I knew I was in love with this skirt the moment I saw it! Then again, how can Tammy resist candy colored.... um anything? I absolutely love this skirt and how fun it is but I have to confess, it has been quite a journey hunting down items I could match it with! The pieces I tried to match it with were either too loud/bold/bright just like the skirt or were too dull so it ended up putting too much focus on the skirt; argh, I just couldn't win! hehe, now you're thinking, WHAT IS IT!!! what have you found? :) well hehe.. I think I'll save it for another post -> I know. what a tease right lol. So tell me, which one of these yummy candy skirts do you like more? Leave me your comments! I would love to hear from you! Without futher ado... I present to you! !